In 1979, S.O.S. 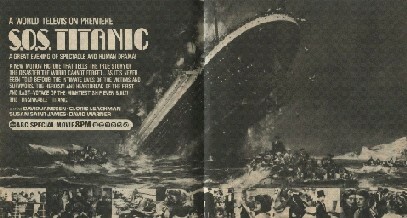 Titanic was a miniseries that ran on ABC on September 23, 1979. The miniseries aired over two nights and totaled two and half hours of run time without commercials. The miniseries was cut to a total of 103 minutes, and was then released in theatres in Europe and DVD everywhere else. In 1990, the miniseries came to the United States and was available on VHS cassette tape, but it had been edited down to around 90 minutes. However, the longer miniseries that first aired in 1979 had disappeared, and bootleg copies of it are said to be available for download on the Internet. For those who are lucky enough to view the version that came out on VHS in 1990, and then are able to see the actual original miniseries, they are going to two see very different movies. 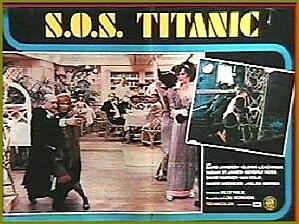 For those that were only able to see the VHS tape copy of S.O.S. Titanic, the beginning of the movie starts out like any other Titanic movie, people are boarding the big ship, and are introduced to some of the most famous passengers like John Jacob Astor, his 18 year old pregnant wife Madeline, Molly Brown, and a few others. However, when people who have the original miniseries begin to watch the way S.O.S. Titanic originally aired, they will see inside the Carpathia’s radio room, a man getting ready for bed, and a burst of beeps that come through his headphones. Anyone that sees the beginning of the miniseries might think that something is wrong because it seems more like the middle than the beginning. Watching a little more reveals the major difference between the original 1979 miniseries and the 1990 VHS release, and that is the fact that the movie is actually about the rescued people from the Titanic, and the scenes on the ship with people boarding is nothing more than a flashback. In every Titanic movie, the focus is more on the ship crashing into the iceberg, and the passengers who either live or die. However, what makes S.O.S. Titanic a little different from the other movies out there about the most famous ship in the world is that this movie focuses on three groups of passengers. The first group of passengers is from first class, which are John Jacob Astor, his 18 year old wife Madeline, and the famous Unsinkable Molly Brown. The second class passengers are second class, and they are Lawrence Beesley, who is played by actor David Warner, a Titanic movie veteran who plays Cal Hockley’s nasty bodyguard in the 1997 James Cameron film, and Leigh Goodwin, a pair of teachers returning to the United States. The last group of featured passengers is a group of Irish immigrants who come on board when Titanic makes a quick stop at Queenstown, Ireland. S.O.S. Titanic shows what each group of passengers is going through as they travel through the North Atlantic on their way to New York City. John Jacob Astor and Madeline have to contend with people being cruel to them over the fact that Astor recently divorced his wife and got married to a woman that is still a teenager. Also, the 18 year old bride Madeline is now carrying his child, which was even more of a scandal than the divorce. Many first class passengers snub John Jacob, and he feels their rejection. However, it is revealed through Astor that his wife was not a loving woman who often treated him cruelly, and his new wife is a much kinder loving woman. Lawrence Beesley and Leigh Goodwin are in the middle, and as second class passengers they are not quite elite, but not with the impoverished third class passengers either. The Irish immigrants have their own dilemmas, which include sea sickness, and also the discrimination they are shown due to their third class status. Also, the immigrants sing songs about America being the land of riches, plenty of jobs, and enough food for all of them to not be hungry anymore. When the collision with the iceberg occurs, all three classes have one goal in mind, and that is to get into a lifeboat before the ship sinks, and it is the third class passengers that have the hardest time escaping the locked gates and finding a way up on deck. Overall, the original miniseries that came out in 1979 is better than the 1990 VHS release. 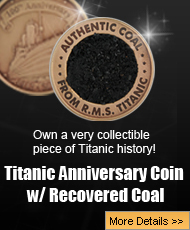 The fact that the disaster is told as a flashback, and focuses more on the passengers and what they are going through, really puts the sinking of the RMS Titanic in a whole new perspective. Next post: A Titanic Controversy – Was Stanley Lord to Blame For The Entire Titanic Disaster?